National Day is coming! I remember singing and loving all the catchy National Day songs during school days; and the fireworks display is my favourite moment of the National Day parade. For all the Singaporeans out there, how are you going to celebrate Singapore’s 49th Birthday? 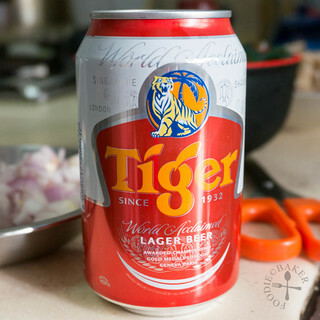 In the case of Tiger Beer, our Singapore-born beer in 1932, it has shed its corporate blue colours and don on Singapore’s national colours – red and white! I received a box of this limited edition Tiger Beer (you might have seen it on my Instagram) and I really love the new colours! Tiger Beer has also collaborated with YouTube stars Tree Potatoes to highlight the nuances of being a true blue Singaporean in the group’s latest video “You Know You’re Singaporean When…” – do check it out and have a good laugh! 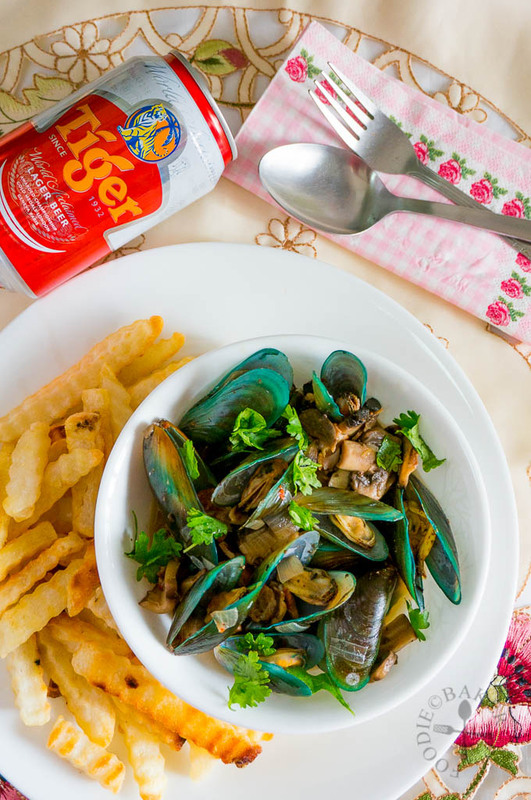 I wanted to incorporate some of this Singapore beer into a recipe, so a friend taught us this quick, easy and delicious one-pot mussels dish, which I served with some baked fries. It may not be a Singaporean dish, but it’s definitely a yummy dish to nom on while watching the live telecast of the National Day parade! 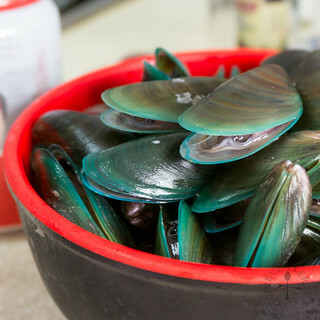 Mussels is also apparently a sustainable seafood choice and it is actually pretty cheap – about $4 per kilogram! So if I add up the rest of the ingredients, probably only about $10 to $15 for 2 people? And that’s for a very satisfying and filling meal! 1) Grab a can of beer - try not to drink it yet! 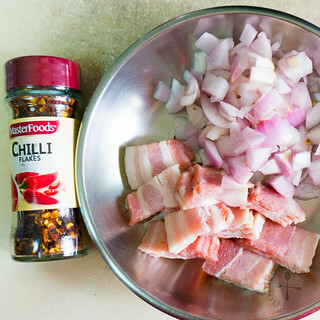 2) Chop some bacon, onion and grab the chili flakes. 3) Don't forget your mussels! 4) And also the mushrooms! 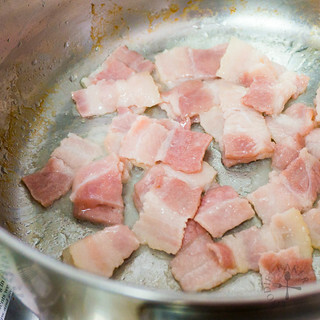 5) Fry the bacon until crispy. 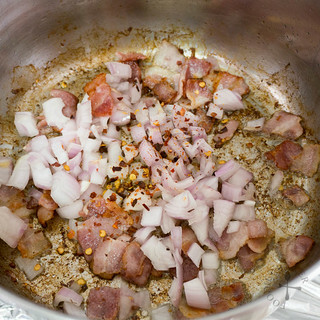 6) Add in the onion and chili flakes. 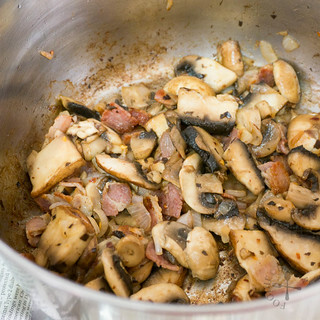 7) Add in the mushrooms. 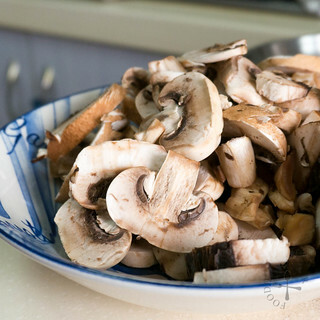 8) Cook until mushrooms have softened. 9) Pour in the can of beer! 10) Followed by the mussels. Simmer until the mussels are cooked – very easy, isn’t it? 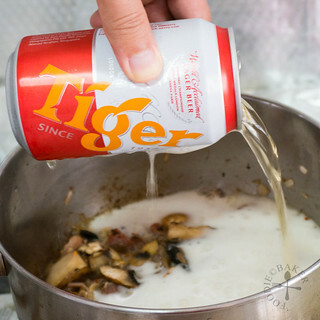 Starting from yesterday, Tiger Beer has kick-start a crowd-sourced movement to get Singaporeans to participate in 49 acts of pride over a period of seven days, till 7 August 2014. To participate, visit Tiger Beer’s Facebook page and follow the instructions to complete acts of pride ranging from posting pictures of your favourite local dishes, pairing Tiger Beer’s limited-edition cans with Singapore’s iconic landmarks, and even uploading videos of yourselves shouting out your love for Singapore in the most creative ways. On completing each act, submit your photos with the #UNCAGE hashtag, and featured acts may just win an invitation to Tiger Beer’s exclusive National Day bash on 9th August! The limited edition red and white livery comes in packs of 10 330ml cans, retailing at a recommended price of $25.60 at all major supermarkets and hypermarkets. Grab yours now and get ready to celebrate Singapore’s birthday! 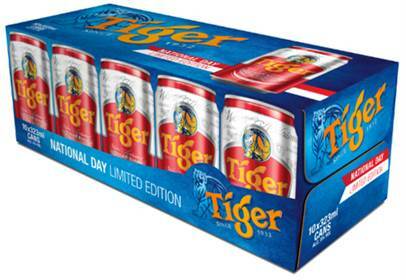 Disclaimer: I was gifted with a box of Tiger Beer to review, no monetary gift was received. In a large pot, heat the olive oil over medium heat. Add in the bacon and fry until the bacon is slightly crispy and the fat has been rendered. Add in onion and chilli flakes and cook until onion has softened. 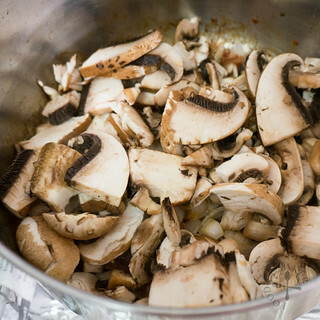 Add in mushrooms and cook until mushrooms have softened and shrink in size. Turn the heat up to high, add in the beer and the mussels. Stir well and cover. 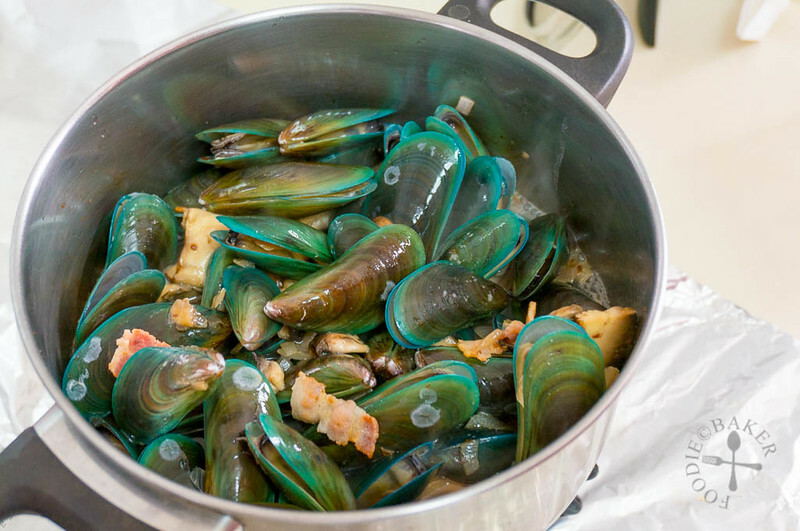 Bring to a boil and lower to a simmer for 5 to 8 minutes, stirring occasionally until the mussels are cooked. Taste the sauce and adjust with salt if needed (it's unlikely you will need more). 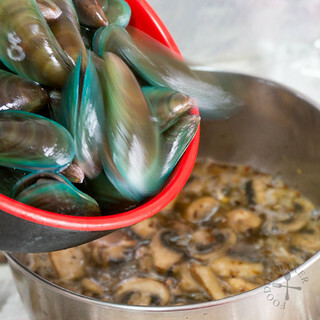 Ladle the mussels and the sauce into a large bowl. (Alternatively, you can serve it directly in the pot!) Sprinkle with coriander/parsley and serve with a huge plate of fries/french bread. 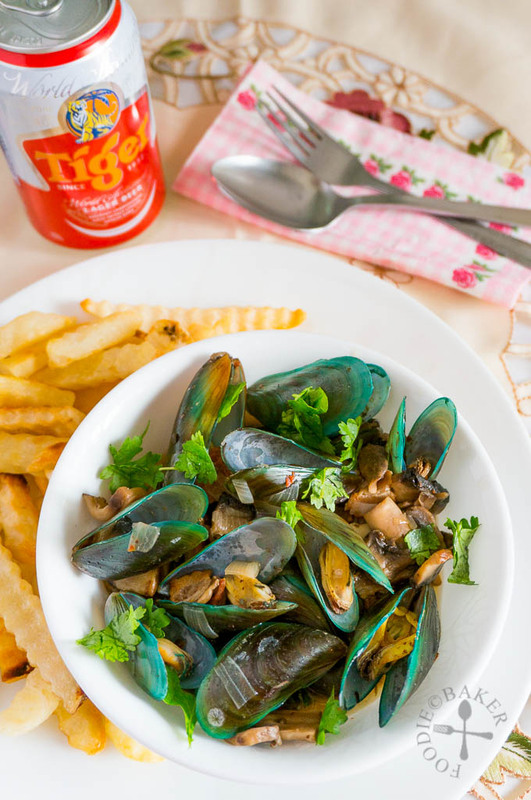 - Sheng Siong and Cold Storage sells fresh mussels that have been debeard. I got mine from Sheng Siong! - Recipe from a friend! The mussels cook in beer sound so special…. this looks seriously tasty. never tried beer with mussels before, definitely curious to know what it tastes like now! Sounds like a tasty dish! Yummy!